As the Israeli operation in Gaza moves toward the end of its third week, voices of criticism are echoing among the international media. Although many people around the world accept Israel's right to defend its citizens from ongoing, daily missile attacks launched by Hamas against Israeli cities, others condemn Israeli actions as an allegedly disproportional reaction toward the Palestinians. Words such as "holocaust" and "massacre" are often used by Palestinian spokesmen, Hamas supporters, and even professional reporters and scholars. In some cases, Israel is accused of conducting a deliberate policy of cruel punishment against Palestinians for Hamas' atrocities. These critics argue that a ratio of 1:100 fatalities proves that Israel's reaction is disproportional. Those arguments, together with images of Palestinian civilian victims, have helped Hamas, Hezbollah, and their Iranian sponsor incite Muslims and non-Muslims all over the world against Israel. But should Israel be blamed for its reaction to Hamas missile attacks? Must Israel save the lives of its citizens by forcing them to live in shelters as a barrage of more than 10,000 missiles drops on their heads day and night? Must Israel shut down its school system to prevent the deaths of hundreds of children in schools and kindergarten classrooms that have already been directly hit by Hamas' missile? Or should Israel use its civilians as human shields and booby-trap their houses, as does Hamas? If, during the last two weeks, Israel had suffered 900 fatalities from the Hamas missile campaign, would this legitimize its defensive operation in Gaza in the eyes of its critics? Would such an operation then be regarded as proportional? Furthermore, by any ratio, should 900 Palestinian fatalities be regarded as a "holocaust"? Although any innocent civilian life lost is tragic, how could the unintentional deaths of those Palestinians - most of whom are admitted by Hamas to be its activists - during more than two weeks of military confrontation, in the most extreme conditions, be defined as a "massacre," especially when this military operation is being conducted in Gaza, one of the most densely populated areas on Earth? The enemy is not just embedded within civilian society but is purposely using civilians as human shields and attempting to direct Israeli soldiers' fire power toward sensitive buildings by launching their attacks and missiles from schools, hospitals, universities and mosques. Should Israel be condemned for trying to limit the number of Palestinian civilian casualties by giving prior warnings, throwing leaflets or sending text messages via cell phones to the residents of civilian buildings that have been hijacked by Hamas for use as weapons warehouses or platforms for missile launchers? Critics of Israel argue that, in asymmetric warfare, the state, as the strongest actor, bears overall responsibility for the loss of noncombatant lives. Those critics, however, turn a blind eye to the fact that this type of warfare transformed long ago into a whole new breed of conflict - a situation of "reverse asymmetry." Whereas the state is bound and shackled by its beliefs and values - moral codes and international humanitarian law - the terrorist organization is exempt from all moral and legal restraints, multiplying its military power by disregarding and exploiting the state's values and rules. One conclusion that needs to be drawn from the conflict in Gaza is the crucial and immediate need to amend the Geneva Conventions to outline the commitments, prohibitions and prerogatives of all parties involved in asymmetric warfare - including terrorist organizations. 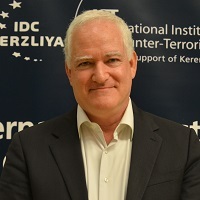 Boaz Ganor is the Koret Distinguished Visiting Fellow at Hoover Institution and deputy dean, Lauder School of Government, Diplomacy and Strategy at the Interdisciplinary Center, Herzliya, Israel.